The wine list at Bavel changes daily. *substitutions and modifications are politely declined. please inform your server of any food allergies. A 4% charge is added to all checks to help cover the cost of health care benefits that we offer for our full-time employees. Thank you for supporting our staff. If you would like this charge removed, please let your server know and the charge will be removed. We made a reservation at the counter which was fun since we got to watch everyone in action. Attention to detail was incredible. Cooks and food runner were very friendly. After dinner we sat at the bar and the drinks and service was amazing. Immediately after getting my drink the hostess told us we had to leave because she had a walk in waiting. What? Her delivery was upsetting and embarrassing. Not a great ending to a our experience. I join for France for a phenomenal dinner tonight. It was a great experience and the wait staff was on top of everything. But the most important thing is the fact that all the food came out smoking hot and had great flavor. It was loud and the cocktails were too sweet. The food, service, ambiance and creativity were incredible. Can’t wait to go back again and fine tune my food order. Hummus, carrots x2 orders, prawns, herb stuffed fish. I want to try the lamb too. I’ll just stick to white wine with the food. The apricot pastry dessert was also incredible. Yum!!! Excellent food - turn down the music so diners can talk and not yell at each other! We had an absolutely glorious meal at Bavel. 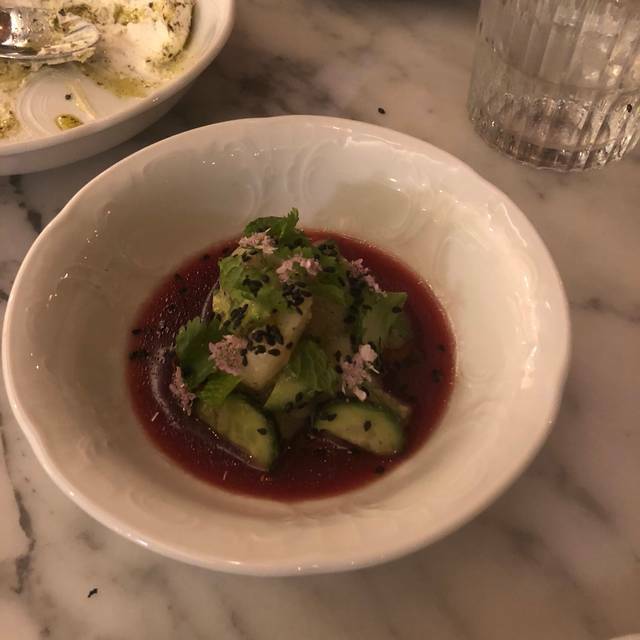 Beware that some appetizers are pleasantly small (scallop crudo) whereas others are rather generous (cauliflower) - we definitely over-ordered but did not regret a thing other than being too full for dessert. It’s a bustling spot with great music and energy so save your tete-a-tete for another night. We had a counter seat and it was great to get to see the magic happening in real time, plus the kitchen staff were awesome and kindly obliged all of our silly questions. The sommelier was outstanding and fun and you will not regret letting him make the choices - never in my life would I have picked a dry sherry to go with oyster mushrooms but the alchemy was real, and the other picks were equally interesting without ever straying into outre-for-its-own-sake territory (a cloudy Assyrtiko that tastes like it maybe came from a shipwreck with my duck ‘nduja hummus? Sounds weird but the correct answer is yes.). Ottolenghi stans will rhapsodize and be right to. Easily among the top meals I’ve had in LA. We are vegetarians so we only had appetizers. it would be nice to incorporate vegetarian entrées (that does not have eggs). Can't wait to go back. All of the dishes are wonderful. Fresh and flavorful. The hummus is to die for! Wonderful evening. 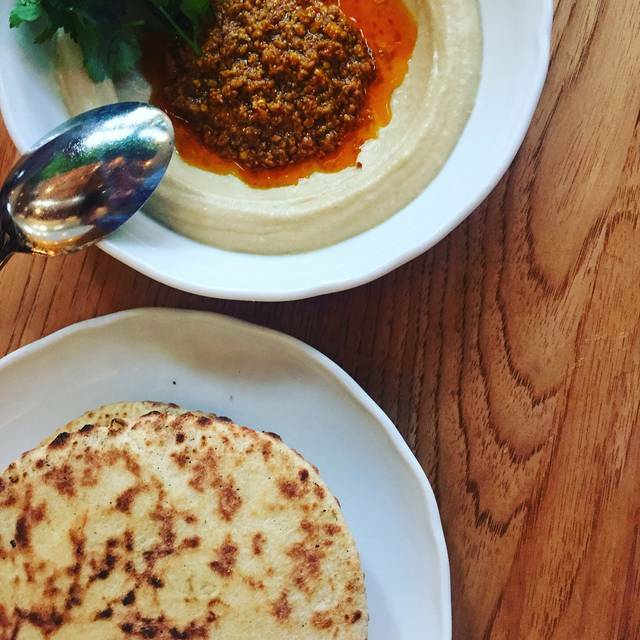 Best hummus and pita bread around. We asked for 2 more pitas though and were charged $4 each without advising us. Cucumber and artichoke appetizer was flavorful. Lamb shawarma was exceptional. Amazing food, service and ambience. A bit loud inside. We strongly recommend this restaurant as the food was good. We had a very late reservation. Many dishes were unavailable (sold out). But the place was jumping. We were seated at the bar ... and the bartenders (who were very cool) were already packing up. So we felt rushed, and somewhat unwelcome. The food (what we were able to order) was very good, and the food servers were friendly and explained the dishes well. The pacing on those dishes was also good. The food is always delicious. Tried the artichoke cucumber salad for the first time and it was one of the best salads I've ever eaten. Sharae took such good care of us and made sure that the food was paced just perfectly. Love the food and ambiance there. It doesn’t disappoint. Ordered the Baba Ganoush, grilled oyster mushrooms, grilled prawns and the lamb neck shawarma. Everything was amazing! The prawns were a standout and I don’t usually like prawns so bonus points for making something that’s usually not my thing and making it memorable. 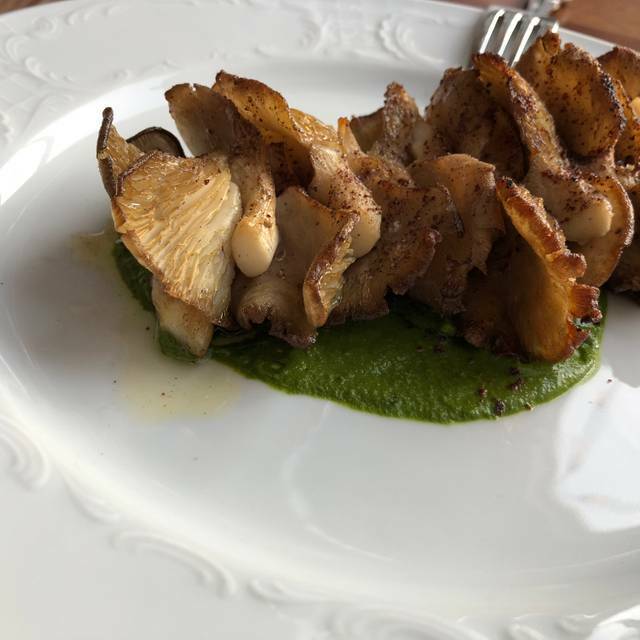 The grilled mushrooms are so simple but loaded with flavor. Could fool you into thinking it was super tender grilled pork loin. The baba ganoush came with a freshly fried pita bread that could hold its own. The lamb was fall of the bone tender, eaten with tahini, spicy mint, pickled vegetables and pita...yummy. Can’t wait to go back. Also notable was the service. Warm, welcoming, and knowledgeable about the menu. Made me feel at home. Drinks were top notch too. Can’t wait to go back. The only mark against the ambiance was how loud the restaurant was. Music was dialed up to 11 which made conversation challenging at times. An amazing culinary experience. A must try! Absolutely one of the best dining experiences I have ever had . 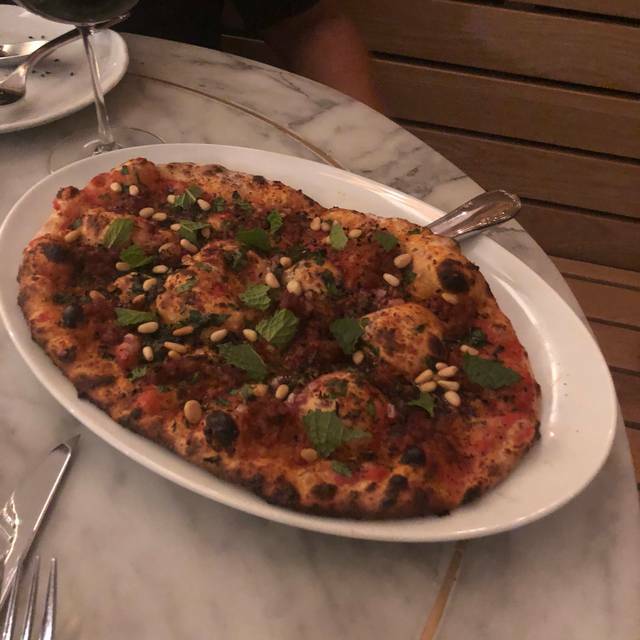 I travel and eat well often , this could be my new favorite restaurant . I was solo , dined at the bar . Rob the bartender walked me through the whole menu and based on what I was in the mood for he helped select a few dishes as well as a great wine pairing . Not only was the service great and the decor beautiful , my Food was amazing - great presentation & delicious , I kept moving my hand every time I took a bite haha because it was THAT good . 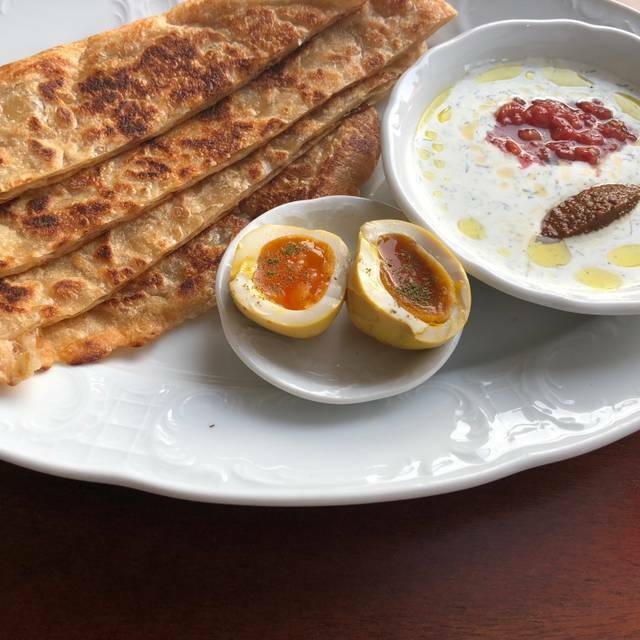 All in once it was a really nice experience cause the staff is were nice and the bread they serve with the duck hummus is just unbelievably good! The lamb is nice too and the deserts are yummy too. I just missed a little bit more juice to it. Sometimes I felt it wasn’t juicy enough..a bit too dry. But still very delicious food and good portions.. The food is good, but I wouldn't say it's outstanding! Drinks are delicious, with a decent wine list. They did not have half the menu available . Everything we wanted was done they had finished . The server did do any good recommendations or offered anything special . Bad first experience not sure if I will recommend this place . Awesome food. Friendly service. Groovy clientele, baby. 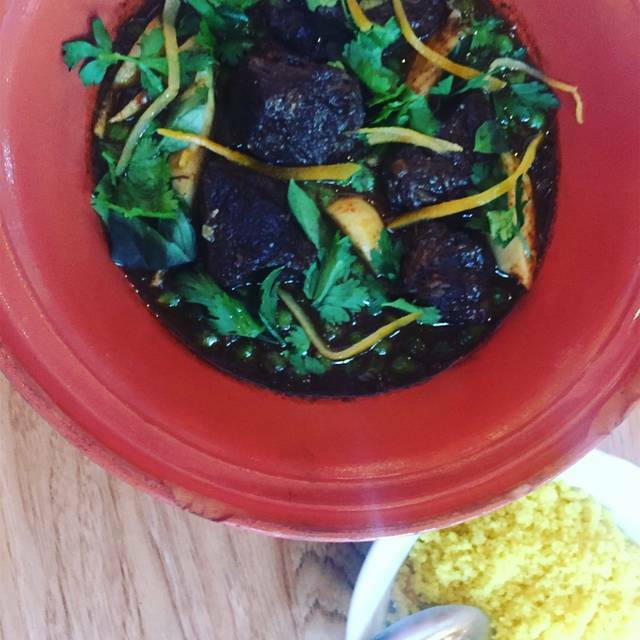 Outstanding middle-Eastern food amongst a buzzy, fun atmosphere. Staff are attentive and knowledgeable - best kind of service. I will definitely be returning. Fish- too salty, beef cheek was tender, but just ok as far as flavor. The cauliflower dish was excellent, but spicy for most at our table. The duck hummus was average. The pita bread was soft and delicious. The cucumber salad was good, but overpriced. The drinks were decent. Presentation of food was good. The hostess at the front was unfriendly and rude. The waitress seemed too busy to deal with us and was hard to extract info from regarding the menu. I was really excited to try this place, but won't be going again. A man threw a drink on the floor on purpose and then while the waiters were cleaning it he threw another one. I called him out on it and then he threw a napkin at the bus boys on the floor cleaning up the broken glass. I feel bad the waitstaff had to endure situation that and I am sincerely sorry that people behave that way in such a beautiful place with great energy. I applaud the staff for being so composed during that event and probably countless others. 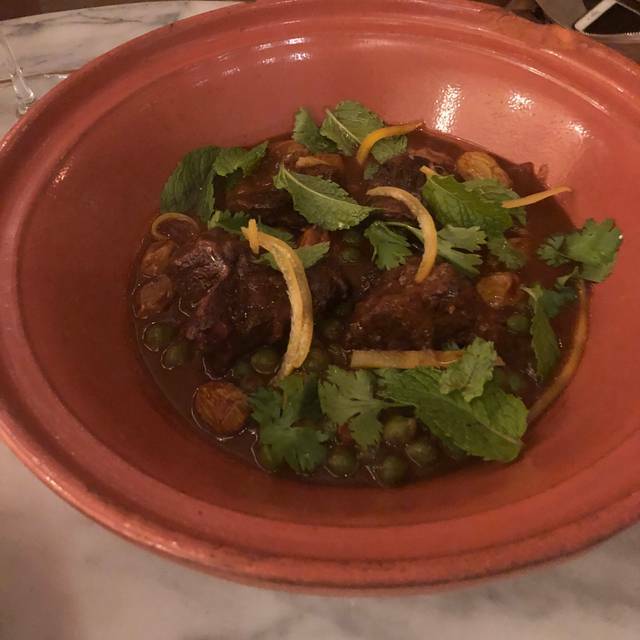 Food was overall very good, but the beef cheek tagine was a little disappointing, dry. The space is beautiful, inside and outside. Very loud so a little difficult for conversation. Service kinda sucked. First waitress literally made fun of us, putting on a dramatic act about how fancy we were, when we requested a dining table instead of a tiny bar table that we were initially brought to (we made a reservation 2 weeks in advance). The "couldn't care less" attitude from the hostess and wait staff continued throughout the evening but was made up by the attentive service of the busboys and lesser-paid service staff. Bavel is such a beautiful restaurant! 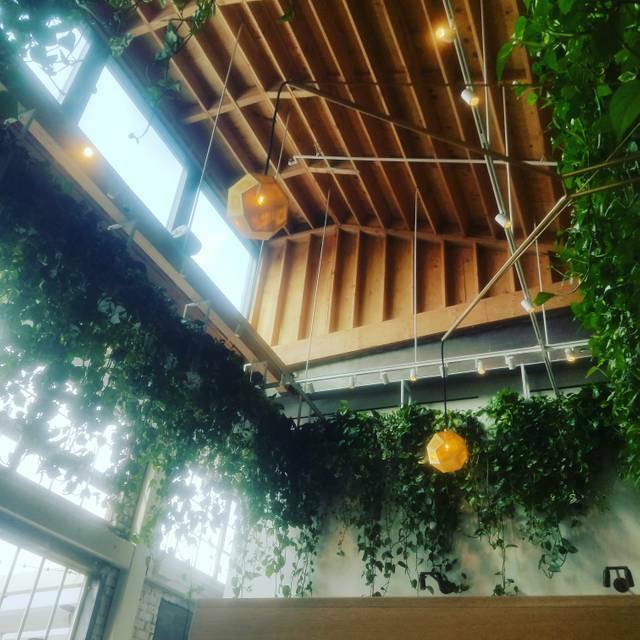 We love the greenery and the huge, open kitchen. Richard was our server this week and he was fantastic! He is knowledgeable about the menu and exudes genuine warmth. The floor somm did not seem to be on par with the level of service from other team members AND he kept scratching and picking at his hair while leaning over our table. Food was fantastic. So flavorful. One of my favorite restaurants. I've yet to have a dish I say anything bad about. Highly recommend. Great for dates, but best with friends you can share dishes with. The food is delicious but it's too expensive and the drinks are outrageous. We ended up leaving too big of a tip but we had 3 drinks and that alone was $65 before food. Everything was amazing, some of the best prawns I’ve ever had! 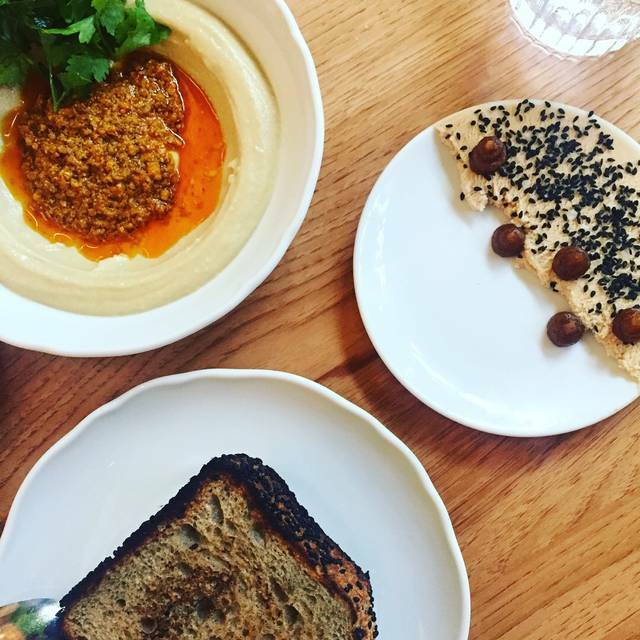 I'm rarely impressed with "Trendy" restaurants, but Bavel delivered on all fronts. I highly recommend eating here, although you need to book way in advance. As always, a memorable evening of superb food. Service is attentive without being intrusive. Really lovely place and tasty food. Only downside is that its so popular, impossible to get in!